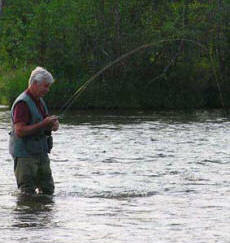 Visitors to the Delta area have a variety of fishing opportunities available. There are numerous lakes along the highway system which are stocked by the Alaska Department of Fish and Game with rainbow trout, silver salmon, Arctic char, lake trout and grayling. Those include Lisa, Donna, Little Donna, Bolio, Donnelly, Mark, North Twin and South Twin lakes. 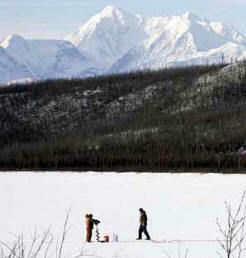 Several lakes, including three of the largest stocked lakes – Quartz, Birch and Harding, all located between Delta and Fairbanks – can he driven to while others are away from the high. way and one must hike in to them. 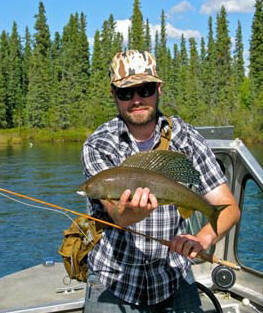 Numerous lakes with natural populations of lake trout, grayling, whitefish and burbot are found in the Paxson and Denali Highway area. Many of these lakes are easily accessible by ear and can be fished from the shoreline. 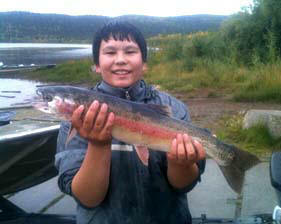 Smaller lakes along Meadows Road and Coal Mine Road near Delta offer a wide diversity of fishing opportunities. Meadows Road lakes are accessible via military roads open to the public, but check in at Fort Greely first. 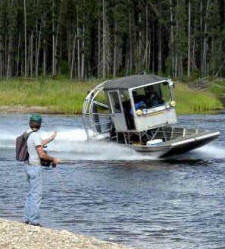 Coal Mine Road offers fishing off the beaten path. 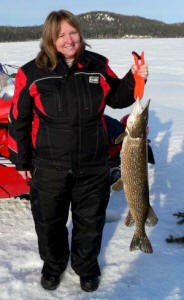 The lakes are small but fishing success for rainbow trout, Arctic char and lake trout is good. Coal Mine Road is not recommended for large camping trailers. Trucks with good traction are advised. Several lakes accessible by trail are found between Delta Junction and Tok. These include Donna Lakes, Bluff Cabin, Jan, Lisa, Craig and Robertson #2. These lakes have been stocked with rainbow trout. Stream fishing for grayling and whitefish is available in several streams in the Delta area including the Delta Clearwater, Shaw Creek, Goodpaster River, Salcha River and the Richardson Clearwater. Access roads are available to limited areas on Shaw Creek, Delta Clearwater and the Salcha River. The others must be reached by riverboat. Visitors are cautioned that the larger rivers are hazardous to travel and proper equipment and knowledge of the area is required. The Tanana River, although turbid from glacial silt, provides fishing opportunities for burbot. Burbot or freshwater lingcod are predators and can be taken with cut bait (non-edible fish parts, herring, liver, etc.). Consult the sport fishing regulations booklet for hook size requirements, etc. Best locations are in back eddies and at the mouths of tributary streams. The Alaska Outdoors Supersite on-line store offers an extensive selection of Alaska fishing books that can help you plan your trip. All residents and nonresidents age 16 or older must purchase and possess a sport fishing license to participate in Alaska sport and personal use fisheries. A resident license for a year is available for $29. A nonresident sportfishing license, good for one calendar year, costs $145. A special nonresident 14-day sportfishing license costs $105, a seven-day license is available for $70, a three-day license is available for $45 and a one-day license is $25.. More information can be found on the Alaska Fish and Game website. Current information for 2019. Fishing gear can be found in sporting goods stores throughout the area, as can good advice on where the ‘best spots’ are. More information on sport fishing opportunities can be obtained from Fish and Game offices in Delta, Tok, Fairbanks and Glennallen and from the Delta Visitors Center. Location maps for lakes along Coal Mine and Meadows roads are available at the Delta F&G office. As you travel through Alaska, refer to the Sport Fishing regulation booklet often to be aware of special regulations that apply to the various regulatory areas and individual waters.